The best overtaker in the business did it again. 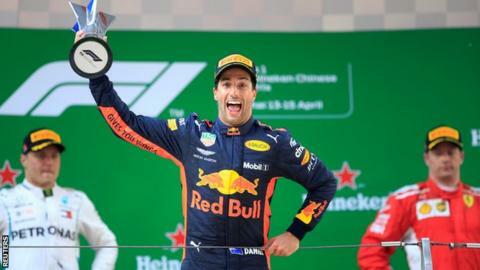 Daniel Ricciardo is gold dust on every level and his remarkable victory in the Chinese Grand Prix lit up what was already turning into an intoxicating Formula 1 season. The Red Bull driver somehow manages to be F1's clown prince and the most irresistible racer on the grid all at the same time. But then that's what his nickname - the honey badger - is all about. As Ricciardo puts it himself: "He seems quite cute and cuddly, but he's supposed to be the most fearless animal in the animal kingdom, and he'll go after anything." It's all part of Ricciardo's colourful personality - the jokes, the lightness of being, the omnipresent neon smile, the 'shoeys' on the podium - but in some ways it sells the Australian short. Not only is he very fast indeed, he will go for moves at the first opportunity, and he can pull them off from what seems like an impossible distance back. All of that requires opportunism and aggression. But it is balanced with an exquisite skill and feel for the car, and a near-impeccable judgement of risk and reward - the sort of judgement his team-mate Max Verstappen did not display in Shanghai on Sunday. How much aggression is too much? Verstappen should have won the race. He was the leading Red Bull driver after the team had made the inspired decision to switch both cars to fresh 'soft' tyres during a mid-race safety-car period. But the Dutchman let the opportunity slip. First, he tried to sit it out with Lewis Hamilton around the outside of the fast Turn Seven when he was not close enough to make it work. As Hamilton said afterwards: "I didn't see him. I was just doing the corner. When I watched the replay, I didn't understand why he was still there." Verstappen ran off the track, and that let Ricciardo through to continue his ultimately winning charge. Once past Hamilton, Verstappen set off after Sebastian Vettel's Ferrari and then made another error, colliding with the Ferrari in a late move into the hairpin. Verstappen is not always the first to hold up his hand to mistakes - but to his credit, he did in China. He could hardly not - this was the third race in succession in which he has hit trouble, and he had been warned by team boss Christian Horner before the weekend that he needed a clean race. But accepting that he needs to look at how he approaches races is the first step to stopping these things happening. Verstappen is far too good not to bounce back from this, and he is likely to emerge an even better driver as a result. If he can rein in things a little and match that extra control with his awesome speed and talent, he will become even more formidable than he promises to be. Unlike Verstappen, Ricciardo got everything just so. And of the five moves he had to pull off to win the race, the two best - and most typical of what he can do that so many others cannot - were on the Mercedes drivers, into the two hairpins. Mercedes F1 boss Toto Wolff described the winning move on Bottas as "a bit brutal", saying: "He had Valtteri helping with that to avoid a collision. If Valtteri had not opened the door, Ricciardo would have taken him out." That is one way of looking at it. The other is that, even though Bottas jinked right to defend, he still left enough room for Ricciardo to get inside him, and the Red Bull was alongside the Mercedes before they reached the turn-in point for the corner. Bottas summed up perfectly the dilemma for any driver defending from Ricciardo in such a situation. "I was going to defend," he said. "It is always a compromise how extreme you go because if you go very extreme then he is definitely going to get you in the exit if he can choose the line. But he tends to find space on the inside even if you defend." Ricciardo said: "It was close. I think it was hard but fair. I saw him defend, so I wanted to go shallower, but then he came a bit more. "I thought about pulling out. No, I'm just kidding. I knew there would always be enough room and the tyres had pretty good grip. So, worst case, I went wide and I'd have another crack somewhere else." What's especially remarkable about these moves is that, for all their lateness and drama, they never look out of control. Ricciardo brakes super-late to get into position, but he hardly ever locks a wheel. There are a lot of drivers in F1 at the moment who show exceptional skills in battle - Hamilton, Verstappen, Vettel and Fernando Alonso are all superb at racing for position - but Ricciardo makes a strong case for being the best of the lot at this aspect of the game. What gave the lead battle an added dimension was that, on arrival in China, Ricciardo had been asked about the last lap of the previous race in Bahrain, when Bottas had been closing on Vettel but did not manage to get past. Ricciardo said: "If I am second on the last lap, you can bet everything I'm going for it. I am not staying in second." His philosophy, he said, was that you had to give it a go, and if it didn't come off, well, at least you had tried. He expanded on this when discussing his own winning moves in China. "Sometimes you've just got to lick the stamp and send it," he said. "A lot of the time you get one chance to try so I made the most of every opportunity." From anyone else, his remarks about Bottas in Bahrain would have sounded like carping, but Ricciardo has a way of making his point with humour and no hint of malice. Occasionally the pressures of F1 have got to him, but only in extremis - such as when he lost victory in Monaco two years ago when his team did not have his tyres ready at a pit stop. Generally, though, he carries his position lightly, and it is never more obvious than when he is in front of the media. He'll often grab the microphone at the start of a news conference and burst into song. He can lighten the atmosphere in a tense situation with a well-judged joke. In Bahrain this year, he arrived early at the table in the Red Bull area, before his media handler had got there. "She's going to freak out," he grinned conspiratorially, "because she'll think I've started. Let's just have a general chit-chat." Conversation quickly drifted to Conor McGregor and cage fighting, which Ricciardo loves with a passion. He revealed he had punched a hole in the wall of his driver room after getting a grid penalty at the first race of the season, at home in Australia. Then the PR handler arrived. He reassured her: "We've just been talking UFC." Are Red Bull in the title battle? The pace of the Red Bulls in the final part of the race not only created a thrilling spectacle, it also raised an intriguing possibility for which there had previously been hints but no hard evidence. They are struggling comparatively in qualifying, where their Renault engine lacks the short-term engine boost enjoyed by Mercedes and Ferrari, but China was the first grand prix in which they have been able to demonstrate their race pace, and it was extremely impressive. The winning move owed a lot to the decision to switch to soft tyres, a decision Wolff said after the race he felt Mercedes should have made, too. But there was no guarantee Hamilton would have been able to go as fast as the Red Bulls had he done so - and the way Verstappen and Ricciardo were able to make their ultra-soft tyres hang on at a strong pace for so long in the opening stint also caught the eye of rival engineers. It indicated that they have an extremely quick race car, tyre off-set notwithstanding. In Australia, Ricciardo and Verstappen spent the entire race bottled up behind slower cars. In Bahrain, both were out by lap four. But they have looked consistently quick on the race runs in Friday practice this season and China suggested they could be a threat to Mercedes and Ferrari for the whole year. The race could have been so different had it not been for the safety car. Vettel was in control until Ferrari somehow allowed themselves to be passed by Bottas, who stopped one lap earlier. Are Honda finally on right track in F1? This seemed to be down to a combination of factors: Ferrari underestimating the power of stopping first in this race, Bottas driving brilliant in and out-laps, an electrifying 1.8-second pit stop by Mercedes, Vettel running wide at the hairpin on his in-lap - slowing the car to the speed limit a few metres earlier than he needed to on pit entry - and a not-great stop by Ferrari, which is understandable after the incident in Bahrain in which a mechanic suffered a broken leg. But still they should not have allowed it to happen. Bottas, perhaps buoyed by leading the race, reckoned he was a pace match for Ferrari on both the soft and medium tyres and that it was only the softest ultra-softs on which they were struggling. But Mercedes were not so sure. Wolff said that, after struggling to get the tyres up to temperature in the chill of qualifying, they were getting too hot in the race. "So we are not in a good place," he said. "We are bouncing between freezing and overheating." He added: "There is never a quick fix but you can see how fast the picture can change. Were Ferrari too cautious in the pits in China following an injury to one of their mechanics in Bahrain? "In testing and Melbourne, people predicted we could run away with the championship because the car was so dominant, and three races in and we're not. This is a great group of people and we just need to get our heads down, stay calm and come up with solutions." As for Hamilton, he has been off-colour in the past two races, by his own admission. Out-qualified by Bottas in both Bahrain and China, the world champion admitted to struggling for pace in qualifying and in the race. Personally, he said, he was "fine - just tired and looking forward to leaving". But he said he would "have to figure out" why he was off the pace. Hamilton dominated in Australia until a calculation error in the pits allowed Vettel to jump him at the stops. But Mercedes have been out-paced in the past two races and suddenly this looks like it could be developing into the most open season for years. "It is clear from this weekend we are not the quickest," Hamilton said. "We have lost performance since Melbourne we are the second, third-fastest team at the moment. So we have some improving to do."